In 1992, an 18-year-old in Italy was picked up by her driving instructor to begin a driving lesson. Soon after, she was raped on the side of the road by the instructor. She pressed charges and won her case. The instructor appealed and the case went to the Italian High Court. 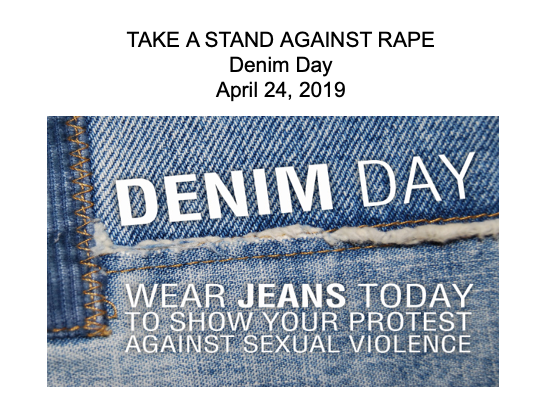 In 1999 the court overturned the conviction with a member of the High Court declaring that since the victim wore very tight jeans, the instructor could not have removed them himself, therefore the victim must have willingly participated. Women of Italian legislature protested the decision by wearing jeans. As news of the decision spread, so did the protest. In April 1999 the state of California established the first Denim Day in the United States.